Corydon Cowansage blends graphic abstraction with figurative realism. 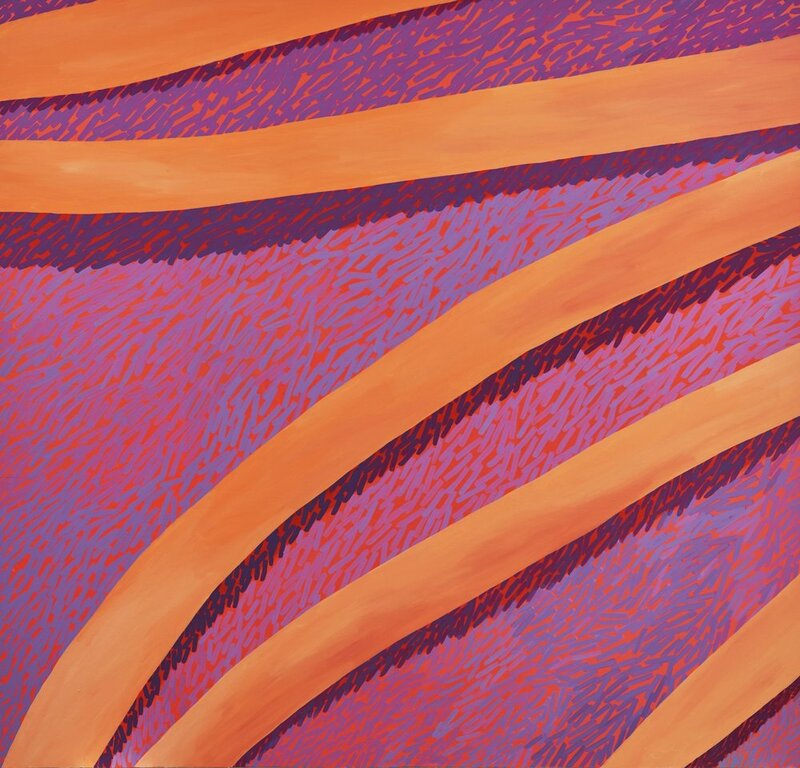 Her paintings examine banal subjects such as brick walls or blades of grass, but she imposes perspectival shifts and heavy manipulation of light and shadow to optically disorient the viewer. Her pieces become windows of infinitely repetitive patterns or microscopic viewpoints that confuse our normal way of seeing. Playing with high contrasting and vivid colors, Cowansage removes her subjects from how they function in actual real space, forcing viewers to re-conceptualize how these images operate as figures and forms. Corydon Cowansage lives and works in New York, with her studio based in the Bronx. Born in Philadelphia, PA, Cowansage earned her BA in studio art from Vassar College and her MFA in painting from Rhode Island School of Design. She has held residencies at the Bronx Museum of the Arts and Yale University, and has shown in numerous group exhibitions across the United States. 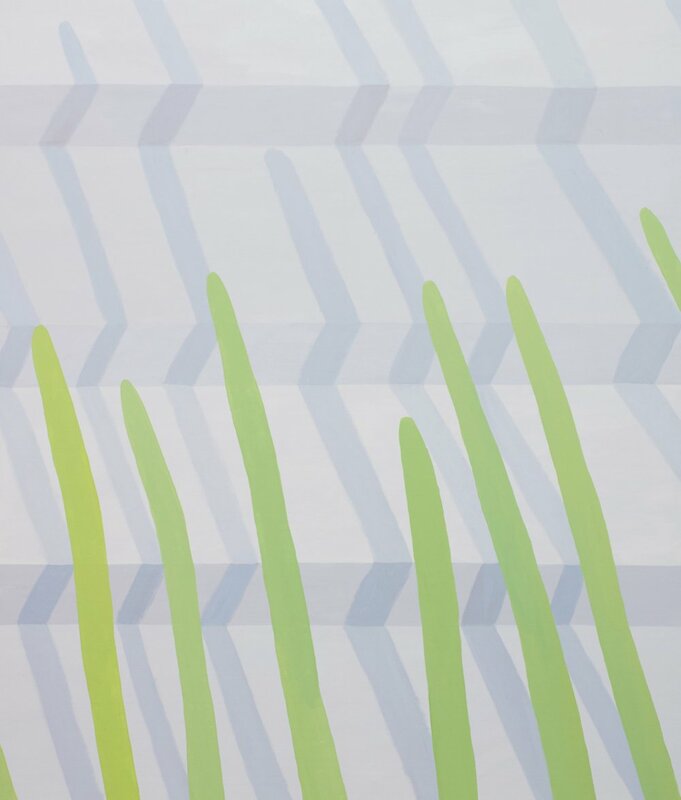 This past fall, Cowansage exhibited a solo show at Miller Contemporary in New York where her work overtook the small gallery space and actively played with the viewers’ interactions and experiences interacting with the art. Her large piece Hole #3 was positioned leaning against the wall, constructing its image as an architectural form and slanting the painting plane so that the viewer was almost stepping into the painting itself. These curatorial choices speak directly to Cowansage’s own interests in challenging perspective and her playful experimentation with planes of space. I met with Cowansage at her studio where we spoke about this recent show at Miller, the development of her current body of work, and her painting process. How did you first become interested in art and start creating work? I always painted and drew when I was growing up. In high school I had a little studio in my parents’ basement and I would paint every day. It was kind of gross though because I was using oil paint and turpentine, and the basement didn’t have very much ventilation. I probably killed a lot of brain cells that way. Then when I went to college I majored in studio art. Most of my paintings are based on things I see when I’m walking around. Lately I’ve been doing a lot of drawing and doodling. Occasionally I also draw in photoshop or sketchup. My dad is an architect and I used to have a job doing AutoCAD architectural drafting, so drawing programs are somewhat intuitive tools for me to use. I’ve also just been painting landscapes for a while, so I guess I’ve developed a certain visual vocabulary that I pull from. What is informing your work? Who or what are you looking at, or what other random things are influencing you? I get ideas just from walking around and looking. I rarely work from photos—usually I’ll make drawings from memories of things that I see and am interested in. I love Mary Heilmann, Alma Thomas, Tomma Abts, Zilia Sánchez, Miriam Shapiro, Judith Bernstein, Georgia O’Keefe, Bridget Riley, Carmen Herrera, Agnes Martin, Andrea Zittel, Maureen Gallace, Judy Chicago, Frank Stella—lots of people. I also watch a lot of movies and TV. I love sci-fi movies. I just saw 2001: A Space Odyssey for the first time since I was little. It was screening at IFC so I got to see it in theaters. I was really into that scene at the end when the astronaut is going through a space vortex—the light and colors are insane. It’s incredible. I was sitting in the theater in shock. Your work plays a lot with manipulations of light and shadow. Can you talk about your interest in this? That’s something that’s always been in my work. I use light and shadow to play with how space is perceived, and to make spaces feel real but also a little bit uncanny. Sometimes I’ll use light and shadow to suggest movement or a particular mood. Your color choices are very vibrant and high-contrast. How do you approach color in your works? I love weird color relationships. I try to use color to depict things in ways that you wouldn’t normally think they would look. My color is usually based on nature and the world as it exists, but it’s really amped up and wacky, or feels kind of synthetic. A lot of times I’ll look at the last few paintings that I’ve made and I’ll try to go somewhere new with the next one. Do you start with a set color palette? Sometimes I do, but not always. I usually have a set palette for my Hole paintings because the color is so specific. For most of my other paintings though, my palette changes as I go in response to how colors interact with each other. I might have an idea about how colors will look together, but they always change based on the other colors around them. These relationships can be surprising, and as a result the final painting might be way different than what I had in mind at the start. Your paintings have distinct perspectival shifts. Can you talk about these choices within the works? In each painting I think about putting the viewer in a weird position, so that even though you’re looking at something pretty banal, it starts to feel uncomfortable. I try to find a position that feels sort of strange or off-kilter. Sometimes I’ll try to make my paintings feel like you’re falling into them or like they’re tilting over onto you, so they have a very spatial, visceral quality to them. Or I’ll try to make things pop out at you or really recede. Your large piece Hole #11 that was leaning against the wall in your show at Miller definitely has that effect on me. It created this sense of infinity that is continuing beyond the canvas and you’re just seeing a sliver of it. Yeah, I really like that way of thinking about it. I thought of that painting as a room divider because it created a funny nook for the gallery desk behind it, but also as a way of expanding or extending the room, even though the painting occupied so much of the gallery space. I also made a gif of a hole based on that painting for the show, and it moved in and out infinitely on loop on the gallery’s website. And there’s a reference to the body in there too—I like playing with that. I have a part-time job at an office, so I’ll work a few weeks full-time and then I’ll have a few weeks off. It actually works well because it gives me chunks of time in the studio and then breaks to process things and think. I have a fairly structured practice and I usually work in the studio from 9 to 6 or so, and then I’ll go home and watch movies, hang out with my cats, send e-mails, think about stuff, etc. I try to take one or two days off from the studio every week in order to be a fully functioning human person. What’s your process like when creating a piece? It’s always different. I used to be super regimented about how I would make paintings, and now I tend to do whatever I feel like. Occasionally my paintings are really planned out, but most of the time I figure things out as I go. A lot of times I’ll take photos of a painting as I work on it and then play with it in Photoshop to see what it needs. I think a lot of painters do that. Do you usually work on pieces individually, or do you tackle multiple at once? Usually I work on one painting at a time. It’s hard for me to work on a bunch of pieces at once and I prefer to get really focused on one instead. If I’m stuck on a painting I’ll move on to another, and then hopefully while working on the next painting I’ll figure out how to solve the one before. I have to mull things over sometimes. What do you think is the most challenging part of painting? A challenge for me is figuring out how to work serially without being redundant, and in a way that’s interesting for me but also for other people. It’s tricky figuring out how to work within a certain subject over a long period but to always keep things moving forward and evolving, without getting stuck making the same painting over and over again. How do you choose the scale of your works? The scale of my work ranges a lot, from around one to nine feet. I really like working big, like six to nine feet. It’s kind of crazy to make paintings that big in general, and it’s especially ridiculous in New York City. But that scale is necessary to get the paintings to do the kinds of spatial, psychological, and optical things that I want them to do sometimes. Also, as a small woman I think I like the idea of making really big work that takes up a lot of space. My name is ambiguous so a lot of times people assume that these were painted by a man. I think the scale and geometry of the work feeds into that misperception for whatever reason, and I like to play with that a little bit. It seems like you’re also playing with ideas of gender through the works, especially with the Hole pieces. Oh yeah. The Holes are the most explicit paintings that I’ve made dealing with that. I think about a lot of these paintings in terms of body parts—hair, fingers, limbs, crevasses. When I was planning the show at Miller, I wanted to make a giant hole painting that would really let viewers go there more directly than some of my the other work that had only subtly hinted in that direction. I find that sometimes people don’t read that into my work at all, and then sometimes people totally do, or it’s even what they see first. Could you talk a little more about how you are thinking of them in terms of body parts? Because these are very common images that you see everyday, how you approach altering that and having them represent something else? I like the idea of a pleasant painting having a subtly vulgar, quirky, or funny read that reveals itself over time. For the Grass paintings, I often think about things like fingers or chest hair. I recently had a studio visit with someone who thought that the blades of grass in Grass #63 and Grass #64 looked like fingerprints because the marks are to scale with fingers. I also find myself sort of anthropomorphizing the paintings themselves, like I’ll think about them squatting or leaning and really inhabiting a space. What do you think makes a painting successful? How do you know when a work is complete? I know a painting is complete when there’s nothing that’s driving me insane when I look at it. I always want everything in my paintings to feel intentional, but I also really like to preserve their awkwardness—I don’t want them to be perfect. When you look at my paintings online or as a jpeg you wouldn’t know that necessarily. A lot of my paintings are so big that when you step back from them or see an image on a computer they seem very pristine and almost feel trompe-l’œil, but then when you get up close to them they’re actually super painterly, and my hand is pretty visible. I like that push and pull. It’s something you can only see in person. Thinking about how they are read on the internet -- is that something you are consciously thinking about or interested in when thinking about painting? Thinking also about the gif you made, are you trying to engage with digital media? I don’t really think about how my paintings will come across on the internet or on a computer when I’m making them. I usually just think of how they’ll be experienced in person. When I document my work I start thinking about that more though. Sometimes I’ll put an object in the frame or set up a little still life next to the painting I’m photographing to help demonstrate scale. Technology is part of our visual language now, it’s part of how we see the world, so I think it’s probably implicitly somewhere in my work. I have an identical twin sister who is a software engineer, and some of her programmer friends connect with my work—I think because there’s a lot of patterning, but the patterning doesn’t necessarily follow set rules. I’ve had people make connections between my paintings and video games. Minecraft has come up, though I’ve never played it. The first time I heard that comparison was in 2011 I think, when my paintings were more representational, so I was pretty shocked by that association at the time actually. I think maybe the way I position the viewer in my paintings—so that they’re pushed down or in a corner or pressed up against the picture plane—is something that happens when you’re playing a first-person video or computer game and you make a mistake, and then get stuck in a weird spot. But again, none of that is ever something that I’m actively thinking about. I’m pretty open to it as a way for somebody to enter into the work though, if that’s where you’re coming from. Do you have any advice for artists, or painters specifically, who are starting to develop their own studio practice? Everyone is different, but for me figuring out the practical parts of my studio practice has been really helpful. Having structure and a regular schedule help me feel sane, and then when I take a break, I know I’ve earned it. A few years ago I built out a studio in Mott Haven in the South Bronx with a couple of friends, which has been awesome. Having a studio that’s big enough and where I actually like to work is essential. I think working out that kind of stuff helps with the most important thing: just keep making your work no matter what!